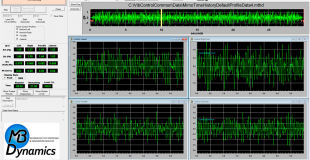 Operating Background Noise Specifications - MB Dynamics, Inc. The use of quiet shaker systems is the basic requirement for effective Squeak & Rattle analysis and testing. The operating background noise of the shaker system should not mask Squeak & Rattle noise or influence objective sound measurements. Therefore Squeak & Rattle test specifications require the use of quiet shaker systems. The requirements and limits for the maximum allowed operating background noise depend on the metrics used for objective Squeak & Rattle measurements. Different test specifications ask for different metrics and operating background noise limits. are oftentimes not defined. Without these references any comparison against the requirements of different test specifications or any comparison of different shaker systems is impossible. The aim of this page is to provide our customers detailed information on how MB measures and specifies operating background noise. Installation conditions, floor conditions, room acoustics and ambient noise inside the acoustic test room have a huge impact on operating background noise measurements. Vibrations in the foundation and noise radiation from floor, walls and ceiling lead to higher background noise levels. Reverberation and pronounced room resonances inside the test room also lead to increase noise levels. 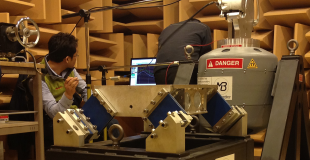 All operating background noise specifications are resulting from acoustic measurements inside a quiet standard acoustic test room at MB Dynamics in Cleveland. This room has no vibration-isolated foundation and is not a hemi- or full anechoic chamber. The ambient noise level inside the test room is typically around 11dB(A). Measurements at such low sound levels require the use of low noise measurement equipment. The shaker system is placed on ISOMODE rubber to avoid rocking on the concrete floor. The operating background noise depends on the vibration level. Operating background noise specifications without clear specification of the vibration level are meaningless! All operating background noise measurements at MB are taken while running a standard Squeak & Rattle test profile with a gRMS vibration level of 0.3gRMS and peak accelerations up to 1g in closed-loop control. Such vibration levels can be found at different components inside the vehicle when driving over a rough cobble stone test track with a medium-sized vehicle. 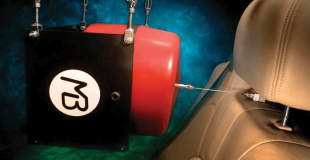 A MB Millenium vibration control system is used for closed loop control of the excitation signal. The distance of the microphone to the shaker system has a direct impact on the operating background noise measurements. In general the noise level increases when moving the microphone closer to the shaker and it decreases when moving the microphone away from the shaker. Operating background noise specifications without a clear indication of the distance in between the microphone and the shaker table are meaningless! MB uses a typical microphone distance of 70cm in between shaker mounting table and the measurement microphone. This distance is comparable to the distance in between the driver´s ear and the instrument panel or other noise critical locations inside a vehicle. Different Squeak & Rattle test specifications require different objective metrics for acoustic measurements. MB specifies the operating background noise by using typical metrics as they are requested in different Squeak & Rattle test specifications. Low-noise measurement equipment must be used to avoid the influence of electrical noise. The repeatability of test results is checked by carrying out multiple measurements. Sound Pressure Level in dB(A): Describes the averaged sound pressure level over the complete measurement time. A-weighting is applied to simulate the sensitivity of human hearing in different frequencies. The A-weighted sound pressure level is the most common metric to describe the averaged volume of a sound. N10 Time Varying Loudness in sone: Time varying loudness describes the loudness of time varying sound (for S&R tests RANDOM noise) at each moment in time. The N10 percentile describes the loudness level which is exceeded in 10% of the total measurement time. The N10 loudness level is therefore a measure of the peak loudness of loudest noise peaks as it perceived by our human hearing. N10 Time Varying Loudness is used for objective Squeak & Rattle tests in different test specifications such as GMW14011 or Ford CETP 01.10-L-413. These test specifications require the use of a 300Hz high-pass filter. To achieve direct comparability to background noise limits requested in these test specifications all N10 time varying loudness measures at MB were taken with the requested HP filter at 300Hz. Noise Rating Curve in NR: The Noise Rating or NR curves were developed by the International Organization for Standardization (ISO). They are used in Squeak & Rattle test specifications like BMW PR311.2 to define the max. allowed operating background noise of the test environment and shaker test system. NR curves define the max. allowed linear sound pressure level (no A-weighting applied) in octave bands from 31.5Hz to 8000Hz. The clear definition of the maximum permissible background noise level in different frequency bands makes sure that Squeak & Rattle noises are not masked by the operating background noise in any frequency range.